The promotion and distribution of male condoms have been an important element of HIV prevention and family planning (FP) programs for host country governments and donors. Years of investment in condom programming have seen significant increases in condom use and total market volume of condoms. However, despite condoms being relatively inexpensive (in comparison to other health products), the majority of condoms distributed in sub-Saharan Africa are subsidized or distributed free through the public sector. 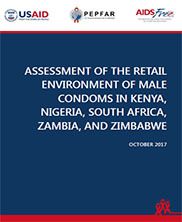 This assessment, which was undertaken by AIDSFree as part of the “20 x 20” condom promotion initiative, explores the retail environment for condoms in five sub-Saharan African countries--Kenya, Nigeria, South Africa, Zambia, and Zimbabwe. This summary report outlines the size and value of the current and potential market for condoms in each of the five countries, including existing infrastructure, regulations, importation, and competing brands. JSI/AIDSFree. 2017.